Who’s Next is a spin of of the traditional game of Higher or Lower and is a game of chance. Place your stake on the turn of the next card themed to your event, the further you dare go the better the odds. 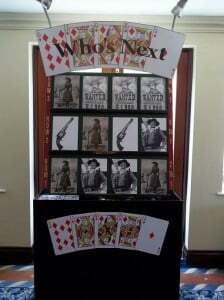 The unique game is available in a number of standard themes including Bond, Western, Gangsters, Bride or Groom, or you can have a bespoke theme of your own. 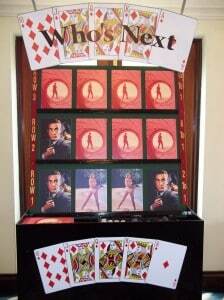 Who’s Next is fun and quick game, brilliant for Expos, Shows and Trade stands, which will increase the footfall to you Exhibition stand. 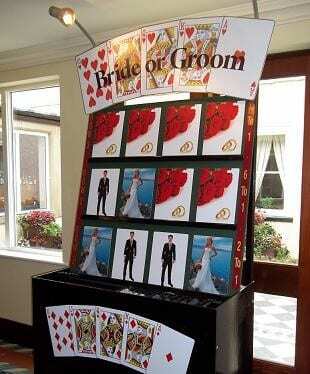 Who’s Next also works well with personalised cards at Weddings, Anniversaries and Birthdays. Cards can be printed with two pictures of people on, guessing who you’ll think will be next, on the back you can have your logo, or any image or writing of your choice.